“Fidelis” follows the path of a man waking up in a broken world that is pockmarked from nuclear strikes and still coping with the lingering effects of a terrible disease. In discovering the new landscape of America, he discovers the equally new landscape of his own soul. Filled with adventure and warfare, as equally compelling is its attempt to explore concepts of truth, valor, manhood, and destiny. In “Fidelis” the crutches of society have collapsed. In this setting, the intangible characteristics that make the human race indomitable are permitted expression. Indeed, they are encouraged. 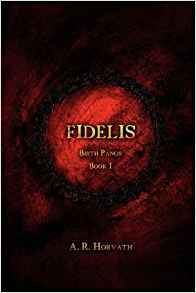 “Fidelis” is the first book of seven in the “Birth Pangs” series by author A.R. Horvath.